Background The Blue Oranda was brought from China to Japan in the late 1950s. It is a striking blue-black color that had never been seen in Japan previously. It is not known how they came to exist. In China, all goldfish that have a dorsal fin with a triple or quadruple tail are called Bungyo (文魚) because when viewed from the top, they resemble the Chinese character ‘文’. Seibungyo (the Blue Oranda) means ‘Blue (sei)’, ‘bun(文)’ and ‘gyo (fish)’. Features The easiest way to explain the characteristics of the Blue Oranda is by describing it as an Oranda that is bluish-black in color. There are two types of the Blue Oranda: one type develops a lump on its head and the other type does not. Seibun that are blue-black in its center that fade out to white are called ‘Hagoromo’, and others that become completely white as they become adults are called ‘Paiphone’. Acquisition difficulties Somewhat difficult. 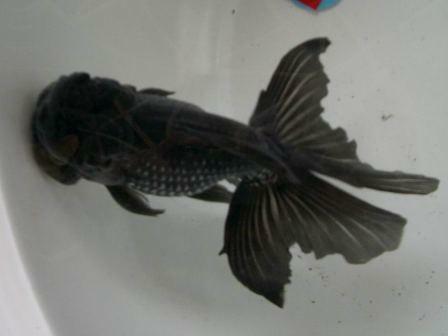 Although the Blue Oranda are popular overseas, they are not popular in Japan. Therefore, distribution amounts are low. Rearing difficulties Normal. They are hard to acquire, however, there are no particular difficulties in rearing. Details of the above photo The Blue Oranda in the photo is the goldfish that received the highest prize in the the Blue Oranda section at the 2005 Japan Goldfish Convention. Traditionally, they are viewed from the side. Other There is a new type of goldfish called the 'Blue Ranchu' which was made by cross-breeding the Ranchu and the Koutou (big-headed) Blue Oranda; a type of the Blue Oranda with a lump.